Looking for tourist information Lucca Italy? Here you will find details of every Italian Tourist Board Office in Lucca and in the surrounding towns and villages. 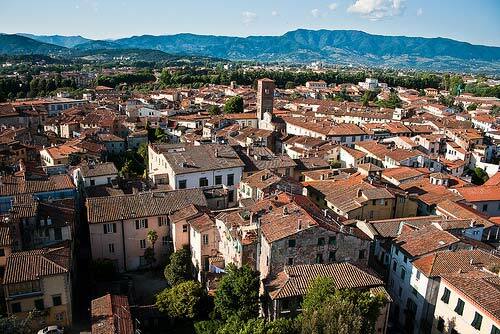 They are great places to find out about festivals and events during your stay in Lucca, to pick up free street maps and information about places to visit, book accommodation and tickets and much more. I will never forget my visit to the Tourist Board Office in Piazza Santa Maria in Lucca. It was a Saturday night and my first night in Italy and I was on my own driving a hire car around the very narrow medieval streets of Lucca looking for the villa accommodation I had booked that my travel guide had indicated was located in the centre of the town. The streets were packed with Italians out for a "due passi": all of whom appeared perplexed as to what I was doing! especially when I reached the end of a street confronted with a 90 degree angle bend and no where to negotiate... Somehow I arrived in the Piazza Santa Maria just as a thunderous summer storm lit up the night sky and saw the lights of the tourist office. The lady on duty kindly gave me directions to my villa - situated out of the town! - and as she locked the doors (I had arrived just as she was closing) the clouds opened and I took shelter from an incredible downpour under the awnings of the restaurant next door. What a first night! I stayed in Lucca for two weeks and loved it. Wishing you a wonderful time there too. For the Tourist Board Offices in the surrounding towns this link (sorry, the page no longer exists in the new ENIT website) will take you to the English language page of the Italian Tourist Board website where they are all listed. This great view of Lucca in the photograph above was taken by spaceodissey.